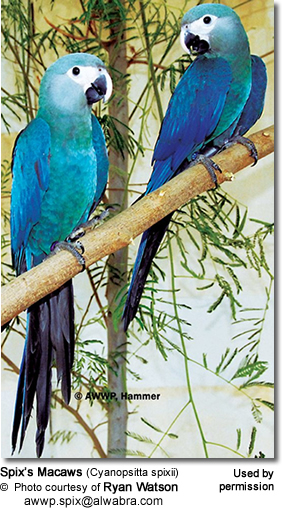 The Spix's Macaw (Cyanopsitta spixii) - also known as the Little Blue Macaw - is by far the rarest Macaw in the world with no known wild specimens remaining (IUCN, 2004). 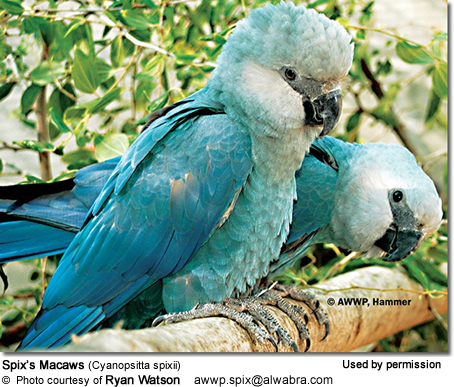 The Spix's Macaw belongs to a group that is commonly referred to as the "Blue Macaws", which includes the closely related Glaucous Macaws (Anodorhynchus glaucus), Lear's Macaws (Anodorhynchus leari) and the Hyacinth (Anodorhynchus. hyacinthinus). All members of this group are either extinct or at risk of becoming extinct. The members of this group were historically frequently confused with each other. Even though the live birds can be identified quite readily by those with basic knowledge of the species; the identification proved far more challenging when working with diseased specimen or only their skins. For example, the first bird found by von Spix was misidentified as a Hyacinth – only two years later, it was noted that this was indeed a new species, and it was named after the person who discovered it (von Spix). This macaw is native to Brazil, South America. 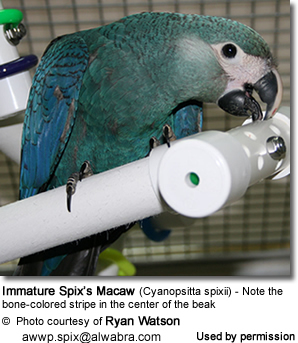 Since 2001, the Spix's Macaw is considered by many to be extinct in the wild; however, since not all areas within its native range have been thoroughly surveyed, it is possible that small surviving populations can be found; or even that the "lonely little blue macaw" will reemerge. Based on the possibility that other specimens may be discovered in the future, this species is currently listed as Critically Endangered (Possibly Extinct in the Wild). In the unlikely event that this will happen, it is certain that the numbers would be small. 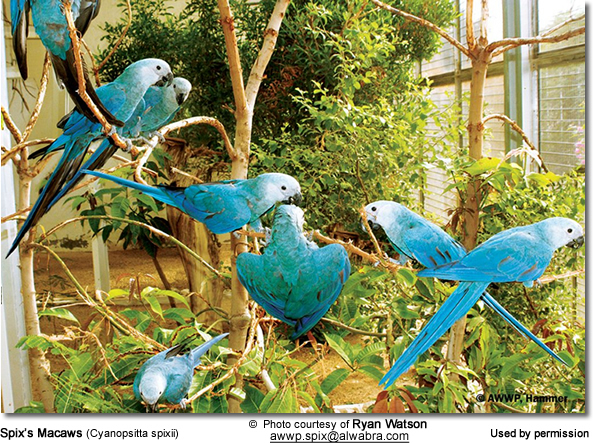 Its decline and possible extinction is primarily attributed to the fact that rare birds are more extremely valuable. In 1987, wealthy collectors paid up to $40,000 for them on the black market. Nowadays, these rare birds, as well as other endangered species, may be sold for $200,000 or more. The sale of rare and endangered species generates approximately US $l0 - US $20 billion a year (third only to drugs and black-market weapons). A small number of captive birds are now part of carefully managed conservation programs in Qatar, Canary Islands, Sao Paulo and Berlin. Annually, millions of dollars are spent on saving this species, and for now, these efforts have been successful. As of 2012, the numbers of registered captive birds has increased to 96. 4 birds (3 of which are confirmed females and 4 males) are kept at the Association for the Conservation of Threatened Parrots (ACTP), Berlin, Germany (3 was bred in captivity - 2 hatched on 18th and 21st January, 2011)2 males and 2 females are kept at the São Paulo Zoo (SPZ), São Paulo, Brazil. Some suggest that up to 120 individuals may exist in private collections - the exact number of which is unknown. 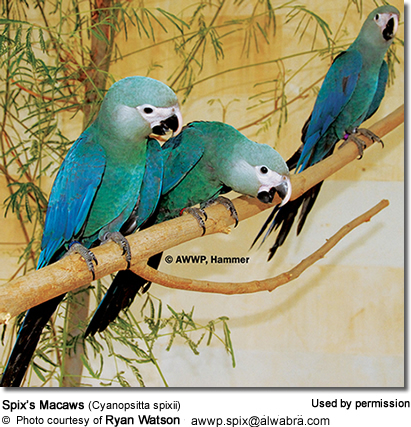 However, what is certain is that these last surviving Spix's Macaws are amongst the most valuable and protected birds in the world. 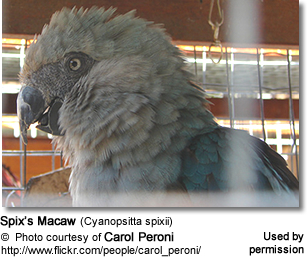 The Spix's Macaws are endemic to interior and northeastern Brazil, where populations of them occurred in southern Piaui (Parnaguá) and north-east Bahia (Juazeiro). They may also have been found in extreme southern Maranhao (Sick and Teixera 1979), western Pernambuco, and northeastern Goias (Ridgely 1981). Local movements are likely in response to environmental conditions or food availability. They were known to be mostly sedentary within their range, with some movements in response to rainfalls, availability of food and favored nesting or roosting sites. All, or most, of their daily activities (foraging, nesting, etc.) were otherwise performed within a limited range. However, outside the breeding season they would sometimes leave their home range for up to several weeks - but nobody really knew where they were at the time. They typically remain close to Caraibeira trees that they use for nesting and roosting. Their dependence on this tree species greatly restricts their natural range in which they occur locally and irregularly. They were rarely observed in groups larger than two or three; however, it is possible that they traveled in flocks of up to fifteen birds before their numbers were so radically diminished. They inhabit the Caraibeira riparian woodland galleries in a semi-arid territory known as the Caatinga, situated along the San Francisco River and other nearby tributaries and creeks. The dominant tree species in that area is the Caribbean Trumpet Trees (tabebuia caraiba or tabebuia aurea) which grow to 8 meters (26 feet) tall. These trees, also known as Caraibeira trees, are often covered in bright yellow flowers and are also the most important tree species for these parrots, as they provide shelter, as well as roosting and nesting opportunities. The Caribbean Trumpet Trees grow at regular intervals along the banks, surrounded with caatinga-type thorn-bush vegetation, such as giant succulents, fachiero cacti, and diverse opuntia types (Collar et al., 1992; Juniper and Yamashita, 1991; Roth and Pittman, 1990). Its habitat was recorded to be groves of buriti palms (Mauritia flexuosa) (Meyer de Schauensee 1971, Sick 1985); however, in the last known location where they were found (Juazeiro/Curaçá), there were hardly any palm trees found. Based on the limited data that is available on this species, They can live between 20 to 40 years, the average being 28 - 29. It is estimated that captive birds can live about 10 years longer than wild specimen. 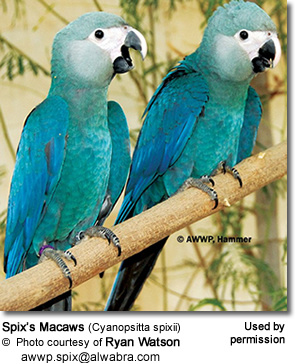 The oldest recorded Spix's Macaw hatched in 1976 and in 2010 - at the ripe age of 35 years - he produced two chicks. (Hatched at the Al Wabra Wildlife Preservation [AWWP] in Doha, Qatar). They feed on various seeds, nuts, fruits (mainly cactus fruits), flowers, leaves and other plant material found within its range. They eat the seeds ofFavela / Faveleira trees (Cnidoscolus phyllacanthus) and Pinhão-brabo trees (Jatropha pohliana var. mollissima); and the fruits of Fachiero cacti (Cereus squamosus) and local licuri palm (Syagrus coronata). Other feeding plants include (or may include) the following.